While court documents filed in relation to the high-profile U.S. legal battle between Apple and Samsung have yielded a treasure trove of images of prototypes and concepts for iPhone and iPad designs, the court case is just now getting underway. Reuters reports on some of the early developments today, including opening statements from Apple's lead lawyer outlining how the company will argue that Samsung's radical shift in phone design was driven by its desire to copy Apple's ideas for the iPhone. 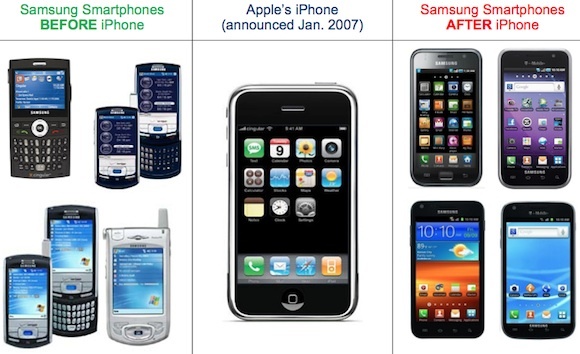 Apple attorney Harold McElhinny started off by showing slides that featured old Samsung phones from 2006 and compared it to the Korean company's newer smartphones from 2010. The key question, McElhinny said, would be how Samsung moved from the old phones to "these phones." "As we all know it is easier to copy than to innovate," he told the court. "Apple had already taken the risks." Key to McElhinny's presentation setting the stage for the trial was evidence in the form of internal Samsung documents showing that the company recognized the design challenges it faced and felt that the iPhone would be "easy to copy". Samsung has yet to make its opening statement in the case, but its filings made so far have shown how it will attempt to undermine Apple's case by arguing that Apple had copied some of its design ideas from others and that it has refused to properly license key technologies controlled by Samsung. Jurors in the trial face a complex task of weighing the merits of Apple's and Samsung's arguments on issues related to patents and trade dress infringement. IDG News Service highlights the instructions given to the jury by Judge Lucy Koh summarizing the basic allegations from each side and offering guidance on how to evaluate the evidence. Pretty damning evidence especially the internal memo about the iPhone being easy to copy. It's only fools with their heads buried in the sands who deny that Samsung cribbed the Apple iPhone playbook. Seriously, do Apple's lawyers even read court briefs ? This is gonna be interesting. These companies suing everybody for everything is getting ridiculous. On the left is Windows Mobile, a stylus & keyboard based OS. On the right is Android, a touch-based OS. Hmm, wonder why they would look so different?
? did you look at the photo? At some point, you have to protect your intellectual knowledge and what you've CREATED, not copied. This goes for any company. I realize it does look silly, but let's say you started a company, created something fantastic and were ready to make millions. Then I came along, stole your design and ideas, then made millions. also interesting is that windows phones seemed to be an important OS pre-iphone, look at all the samsung phones from 2006 using windows mobile 5! the world has indeed changed after the iphone introduction! Most computers look the same. Most cars look the same. Many things look the same or similar. It just seems we as a society have just become so litigious and offended at everything. How about flattered? How about we try that one on. Flattery. I'm an Apple fan but this is getting out of hand.